Over 120 exhibitors promote sustainability at our festival each year! 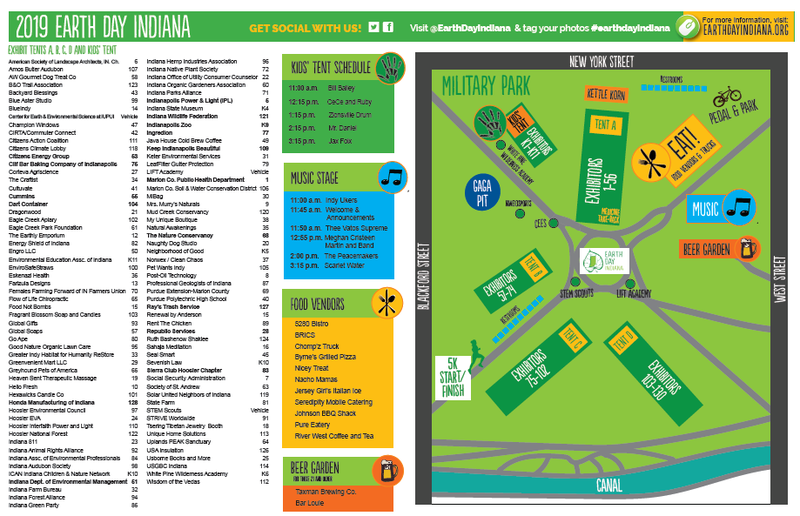 Support the Earth Day Indiana Festival! 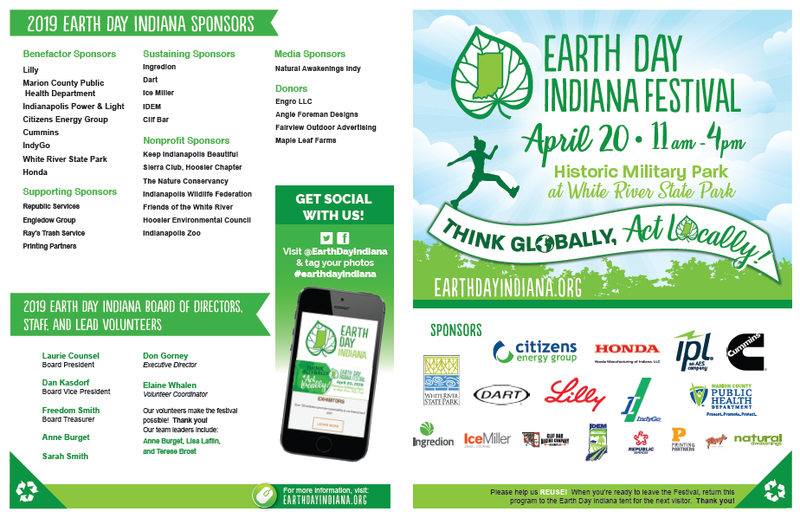 The 2019 Earth Day Indiana Festival, our 30th annual!, will be held on Saturday, April 20, 2019, from 11:00 a.m. to 4:00 p.m. at Historic Military Park at White River State Park in downtown Indianapolis. The festival has over 110 exhibitors, live music, food trucks, beer garden, and a 5K run/walk. Kid's activities include an Eco-Easter Egg Hunt at 2:00pm, STEM Scouts mobile laboratory, LIFT Academy flight simulators, IUPUI's Center for Earth & Environmental Science STEM mobile lab, Nine13sports' Kids Riding Bikes, and hands-on activities provided by the Indianapolis Zoo, Indiana State Museum, White Pine Wilderness Academy and more. All ages can enjoy Giant Jenga, hula hoops, frisbees, lightsaber duels and a GaGa Pit. This family-friendly event is FREE. Clean out your junk drawer and bring along used cell phones (including chargers & cords!) and old batteries. Better than driving downtown is to take IndyGo! Whether you plan to be on foot for the day or want to bring along your bike, IndyGo has you covered. If you bike and bus to Military Park we will watch your bike for free at our Pedal and Park area as you enjoy the festival or other downtown happenings. Just be sure to be back by 4pm. Back in 2019 is the Recycle Run 5K! Run or walk a 5K route that is mostly along the White River! The 5K begins (at noon) and finishes at Historic Military Park at White River State Park but the majority of the course will take you upstream and then downstream along the White River. Registrations for the 5K will open on or about November 20, 2018. REGISTER FOR THE 5K OR A 1-MILE WALK AT RUNSIGNUP For adults participating in the Recycle Run, Taxman Brewing Co. and Bar Louie will be in our Beer Garden. You must be 21 to enter the Beer Garden area.